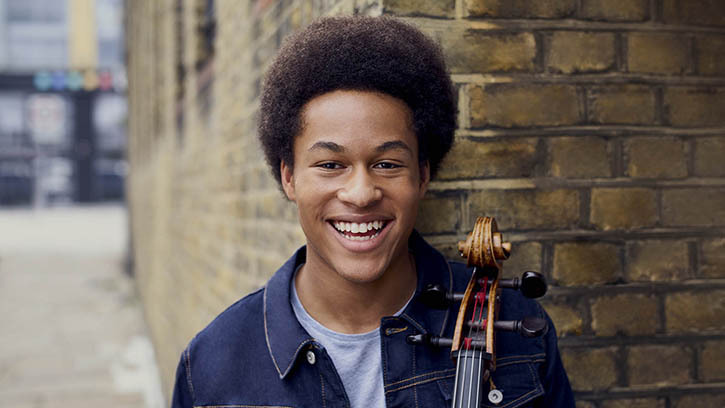 After standout performances during the Royal Wedding, British cellist Sheku Kanneh-Mason makes his U.S. orchestral debut with the Seattle Symphony, October 18–20. The 19-year-old British cellist Sheku Kanneh-Mason captivated audiences worldwide during Prince Harry and Meghan Markle’s wedding this past weekend. He will make his U.S. orchestral debut in Seattle this fall, performing Tchaikovsky’s beloved Rococo Variations with conductor Ruth Reinhardt and the Seattle Symphony on October 18–20. Kanneh-Mason was previously scheduled to appear as a guest soloist with the Los Angeles Chamber Orchestra this past weekend, which would have been his U.S. debut — until Markle called, inviting him to perform at the Royal wedding. According to a report in the Los Angeles Times, Prince Harry saw Kanneh-Mason perform in London last summer and the couple invited him to perform. During the wedding, the congregation at St. George’s Chapel watched in rapt silence as Kanneh-Mason gracefully performed Gabriel Fauré's Après un rêve, Franz Schubert's Ave Maria and Maria Theresia von Paradis' Sicilienne. "The atmosphere was amazing and I'm proud to have played a small part in the celebrations," Mason tweeted after the ceremony. "It's a day I will remember for the rest of my life." Currently a student at the Royal Academy of Music, Kanneh-Mason won the BBC’s Young Musician of the Year Award in 2016. In January 2018 he released his debut album Inspiration, pairing Shostakovich’s Cello Concerto No. 1 with covers of songs by Bob Marley and Leonard Cohen. Kanneh-Mason will perform with conductor Ruth Reinhardt and the Seattle Symphony on the Masterworks Season concerts on October 18 and 20 and as part of the Symphony’s Untuxed series on October 19. In addition to Tchaikovsky’s Rococo Variations, the concerts include Beethoven’s Symphony No. 1 and, on October 18 and 20, the concerts include performances of Kaija Saariaho’s Ciel d'hiver and Schumann’s Manfred Overture. Single tickets for the 2018–2019 season go on sale this August. Subscribe now for the best seats at the best prices! Sheku Kanneh-Mason's performances are generously underwritten by Grant and Dorrit Saviers through the Seattle Symphony's Guest Artists Circle.